Following the official announcement from Manchester United that has made the signing of Lindelof almost imminent, the potential partnership of himself and Eric Bailly are all that fans have been talking about. In a season where Mourinho himself has been ever so critical of the desire of certain United defenders, his own signing of Eric Bailly has reminded fans of what a real defender is. In all honesty, fans have not been so praising of a defender’s performances since the days of when we possessed talents such as Vidic, Ferdinand and even Jaap Stam. This season Bailly has established himself as a real fan favourite and Mourinho’s first ever signing for the club looks to be one that holds all the right credentials to place him alongside club icons such as the names I have just mentioned. However with the exception to Marcos Rojo and a few reliable performances from Daley Blind, United have struggled to find that perfect partner in crime for Bailly, as it seems even Jose himself cannot find a preferred defensive partnership within the current squad. The signing of Lindelof actually holds similar feels to that of Bailly’s arrival almost a year ago. A young exciting prospect who has the chance to prove himself on the big stage, the capture of Lindelof has certainly been welcomed by fans with real scepticism and it looks as though himself and Bailly could be the answer to United’s problem at the back. It is a fair assessment to state that Jose Mourinho is somewhat of an expert when it comes to the defensive part of the game. It is an area in football in which some managers tend to shy away from, as it is perhaps the easy option to go out and win fans approval through entertaining attacking football. In Mourinho’s case however, the Portuguese mastermind has made a living through his philosophy of strongly disciplined defensive teams, in which he always favours ‘warrior type players’ that he can rely on. It is from Mourinho’s track record alone that we as fans should trust Mourinho with any defensive signing such as this. The perfect example can be provided with Eric Bailly himself, a player who arrived as a rather unrecognisable name to some fans who has now quickly transformed into United’s number one defender. When you analyse Mourinho’s reigns at other clubs he has always excelled through his defensive recruits, such as the likes of Lucio, Carvalho and Varane as Mourinho evidently recognises a defensive talent when he sees one. 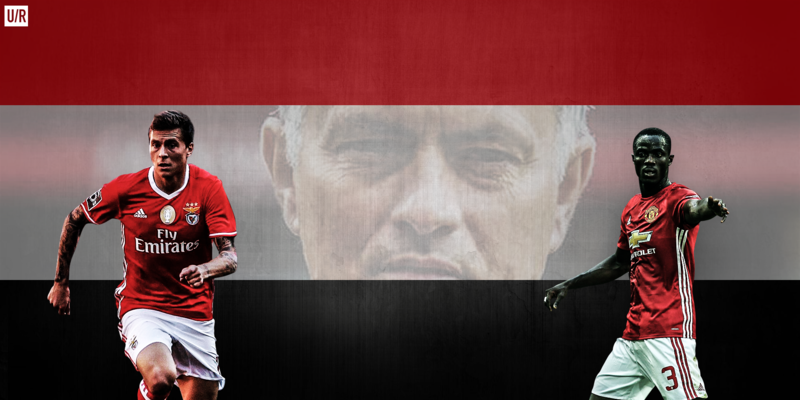 The proposition of Bailly and Lindelof actually draw some parallels to that of Lucio and Samuel, Mourinho’s favoured centre-half partnership during his famous treble winning season at Inter Milan. Both these players certainly epitomise the type of defender that your manager loves to have in the team and the types of defenders that strikers certainly do not look forward to facing. Their similar aggression and desire on the pitch that both players shared certainly combined well and thus established a formidable partnership that is fondly remembered in the clubs history. It appears that Bailly and Lindelof are also a similar type of player as they possess that killer winning mentality (as proven through their success at youth and senior levels) and when given the chance together, one can only foresee positive outcomes with having them both in the same back-line. It seems with Eric Bailly being just 23 and Lindelof at 22, there is hope from fans that this could be the founding of a partnership that could serve at the club for the next decade. It would be a fair assessment to say that United have yet to come close in finding a consistently reliable centre-half partnership since the notorious days of Nemanja Vidic and Rio Ferdinand. There must be a long-term vision here from Mourinho who looks to be forming a team that can compete at a high intensity level for the next four to five years. When discussing a potential partnership between two players, particularly with defenders, it of course comes down to simply more than placing two quality players next to each other and expecting them to automatically click. In fact, the best defensive partnerships stem from players who compliment each other in sharing the same quality abilities but also by counteracting their partner’s weaknesses. As United fans have seen this season, Bailly is certainly an aggressive type of defender who is always eager to push forward out of the defensive line and certainly favours to operate as more of a ‘stopper’. Lindelof on the other hand is recognised for his trait of not lunging into tackles and possesses a much more composed persona, something that would compliment Bailly as the Swede acts in a more covering style of play, as seen below. This trait is further supplemented by Lindelof’s ability to play in a defensive midfielder role and thus highlights his more composed and defensively reassuring approach to the game. It may also come as a surprise to many that the Swede does also possess a quick burst of pace as he certainly looks to be a perfectly all rounded defender, rather similar to Bailly himself. The mixture of being both physically strong in the air and also being a tough opponent to outpace on the ground thus makes both the defenders part of the rare breed that other players such as a Ramos or Boateng belong too. As mentioned, Mourinho rarely goes wrong when it comes to recruiting new defenders and if Lindelof settles at a similar pace to Bailly, the potential partnership of the two should be nothing short of welcomed with open arms from United fans.